Upon the first taste of this “salt” I immediately thought about steaks (think “Montreal seasoning”), and then, being the snack food junkie I am – soft pretzels. So those are the two foods I first tried them on for this review. Of course, a few slices of pizza were in order too – pizza being the number one snack food of sauce reviewers (unofficially). Ingredients: garlic, Kosher salt, pepper. Texture & Appearance: A very coarse grind. The biggest bits are the dehydrated garlic, and it’s so yummy, I could just eat it from a spoon – it’s like garlic candy. The kosher salt is next… in smaller bits. Finally, fresh, cracked black pepper rounds out the bulk of the mix. It almost looks like something you could make at home, but why would you? This is so much better. Taste Straight Up: It’s gourmet quality garlic salt, with a hint of black pepper. Label/Graphics: – Good simple label. A product worthy of shelf space in Williams-Sonoma stores. Almost a “throwback” style of graphics that could remind you of the tins of products from the turn of the century. I love this label. A small graphic of a “stick figure guy” is center… and there’s a good story about that guy on Slavo’s website. You would think we were having blue cheese “pie”. But here’s a pic of our mise-en-place in preparation of the rib-eyes. 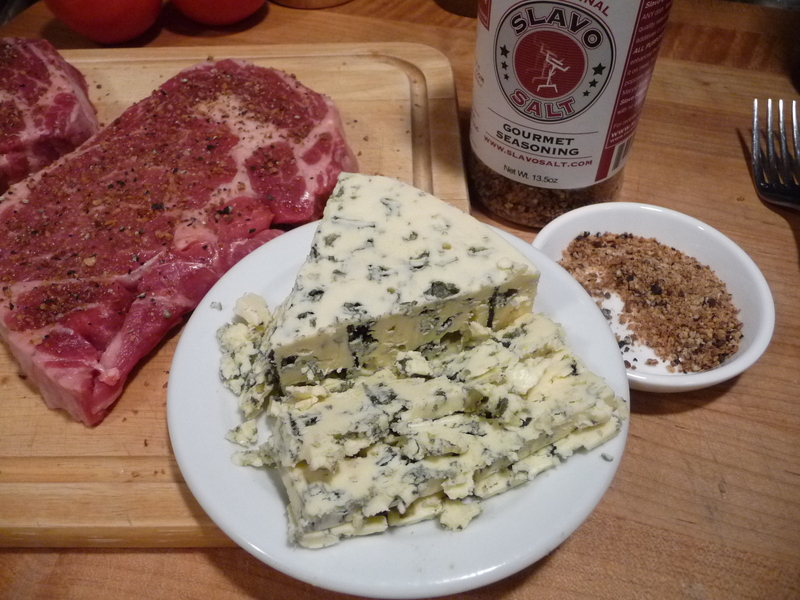 Steak, Slavo Salt, blue cheese. What more do you need? The finished, grilled steak was wonderful. We paired it with some sweet corn on the cob. 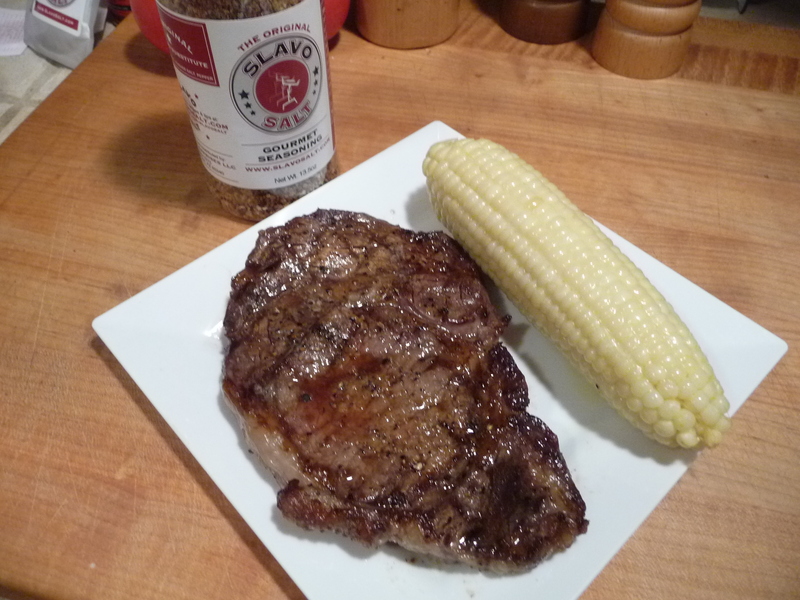 Slavo Salt encrusted steak with corn on the cob. 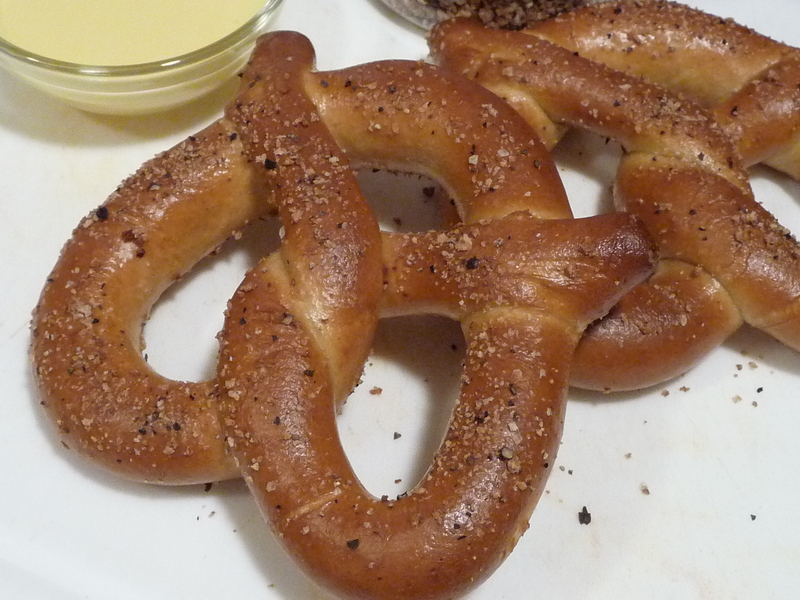 The second thing I wanted to use Slavo’s on was soft pretzels. It worked like a charm – almost like it was just made for this most American snack treat. I’m sorry, at this time, I have no pics of the Slavo Salt on pizza… but we really did eat it that way. 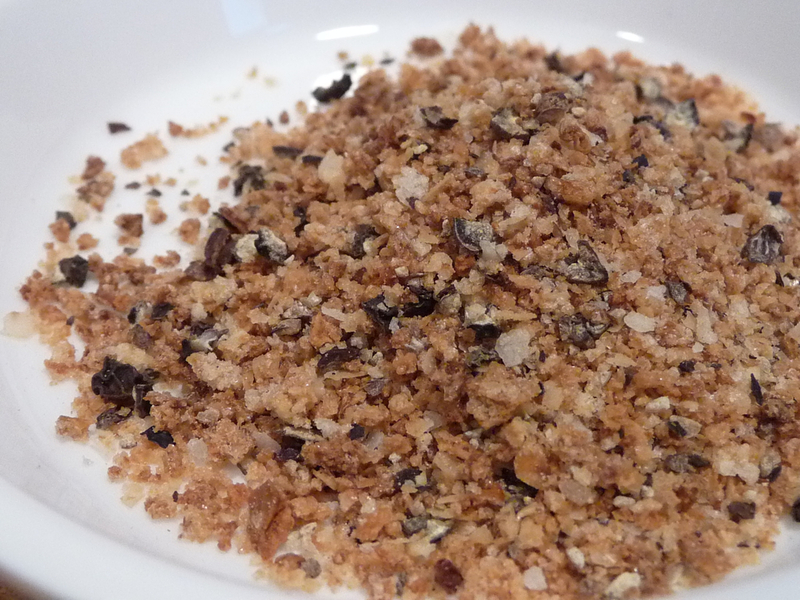 As it turns out, there wasn’t much point of taking pics of Slavo Salt on pizza… it’s garlic, salt and pepper. You get the idea. Overall Rating (Taste on Food, Final Thoughts): – A simple, yet delicious blend. Worthy of a kitchen staple to be kept on hand. Gourmet quality at its finest. This one is a keeper. Yea, the big guy will cost you $12, but it’s worth it, as this Gourmet Salt shaker will last you a while. 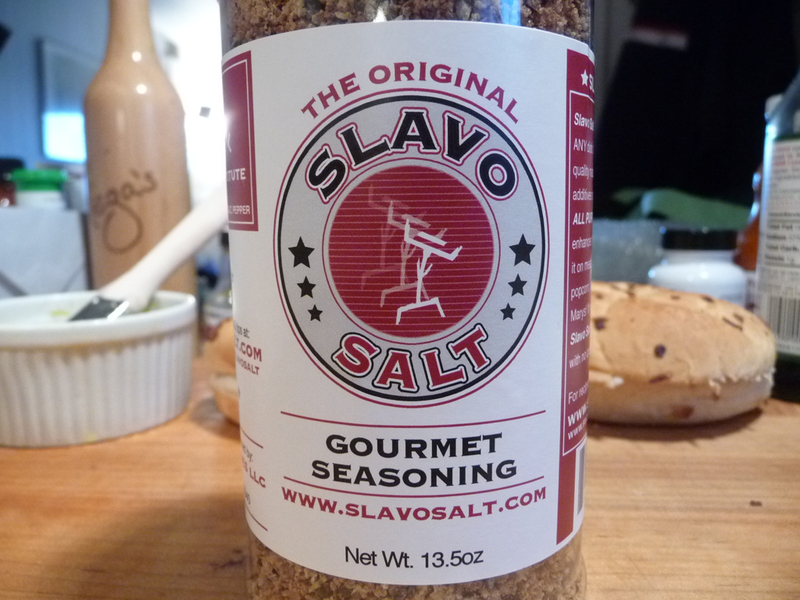 If you don’t absolutely love Slavo Salt, we will return your money with no questions asked. I am considered the “Steak Queen” in our household, as Brian has found that if he lets me grill the steaks, they always come out better. 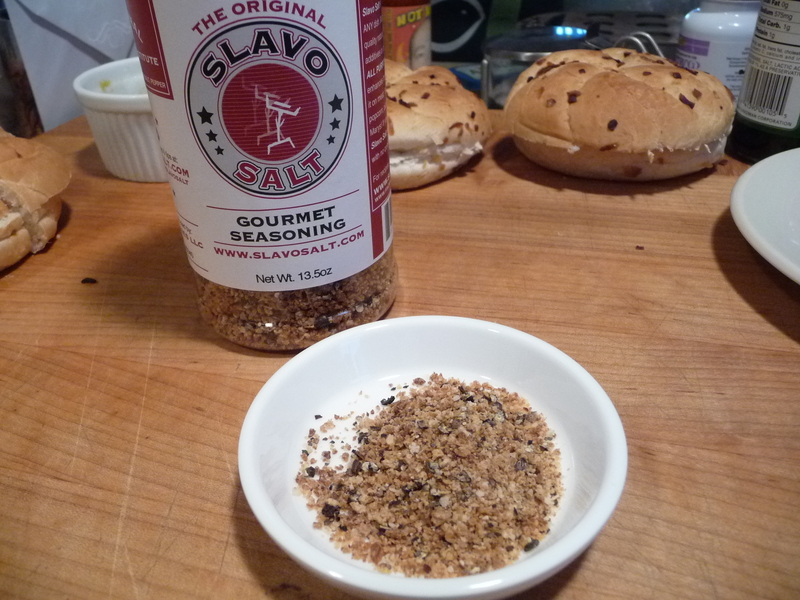 This seasoning has replaced my usual “some black pepper, some kosher salt, and some garlic powder”, and Slavo Salt has come up with the perfect combination of the three, without risking overdoing any of the components…. yes, I have been guilty of over-salting sometimes. No longer! 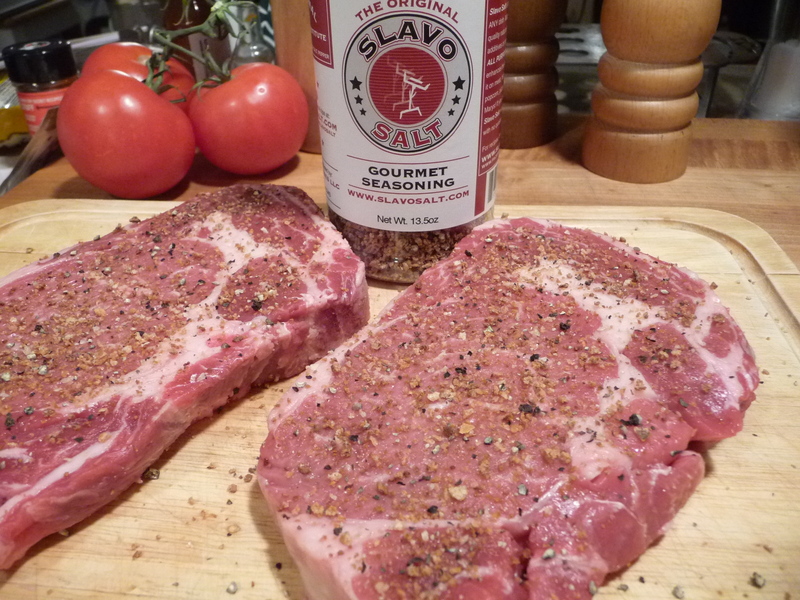 Slavo Salt is now all I will use when grilling our ribeyes! Winner! Thanks so much for all of the positive feedback, we love hearing from the fans of Slavo Salt. You’re a lucky man to be with the Steak Queen! Thanks again and keep up the good work! This would be great of a rack of beef ribs, don’t you think? I’ve never tackled such a beast. But Marilyn agrees with you! Hey Great Review! I couldn’t agree more this is definitely a staple of my kitchen. I use it daily! It has replaced anything I would normally put salt or pepper on and made everything I make much better (i’m a pretty bad cook so I need all the help I can get). Also I love Slavo Salt’s facebook page because they’re always uploading recipes that I can actually make and describe it in an easy to understand way. Much easier than scavenging the ends of the internet for good recipes. Thanks, Brittan! Always nice to hear from a fan of Slavo’s.